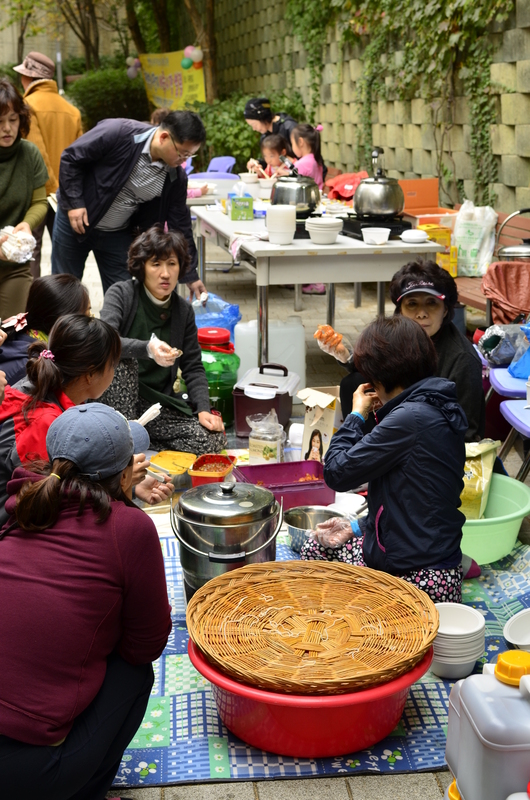 We got into it last year when our local neighbourhood, 4 danji (4단지), in Yeongtong organised a small one in between the three main apartment complexes. There is nice treelined laneway which cuts in between the three big apartment complexes. Here vendors set up their stuff on one side, while people were free to walk up and down checking out what people had to sell. There was also a stall selling noodles, or to be specific 잔치국수, and a person with a long table full of pickled roe and squid. We did alright that day. In fact we did so well that we set our sights on next year as we headed up the steps to our appartment double counting our thick bunch of 1000 won notes. It was also good fun. We paid for dinner that night, but we also found a rare sampling of community which is hard to find in the often bland and solitary apartment complex. As it was a Saturday, there were all kinds of people out getting involved. Of course there were familys selling all their household bits and pieces, like clothes, books, toys, and of course ornaments, jewelry, and kitchen wares. There were also plenty of the same kind of people walking up and down haggling for the best deal. 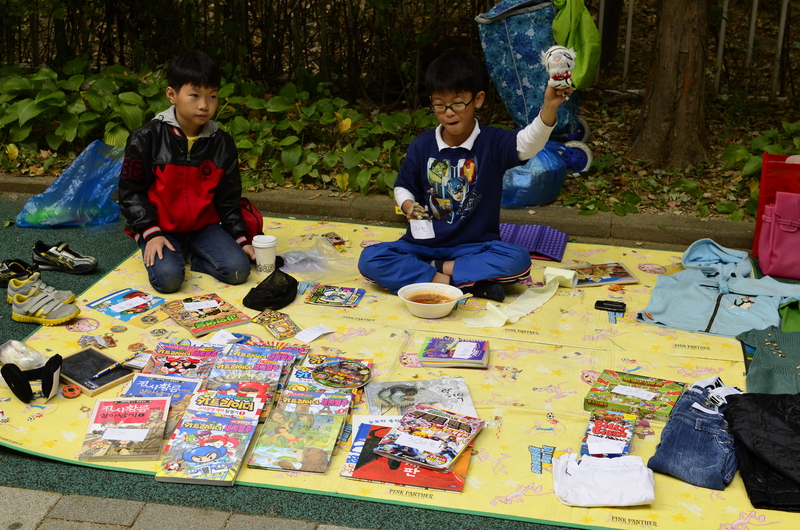 It was really just a bit of fun, and I don’t think we sold anything for over 5000 won. This year we thought we had our secret weapon, the diamond we could sell for millions and retire off the takings. We had for the past ten months building up a bounty of baby clothes and other baby related goodies, which had gone beyond their use for obvious reasons, and we now planned to put their former owner through university with the proceeds from their sale. Ready for our onslaught of the flea markets of Suwon, Herself found our first battle ground. 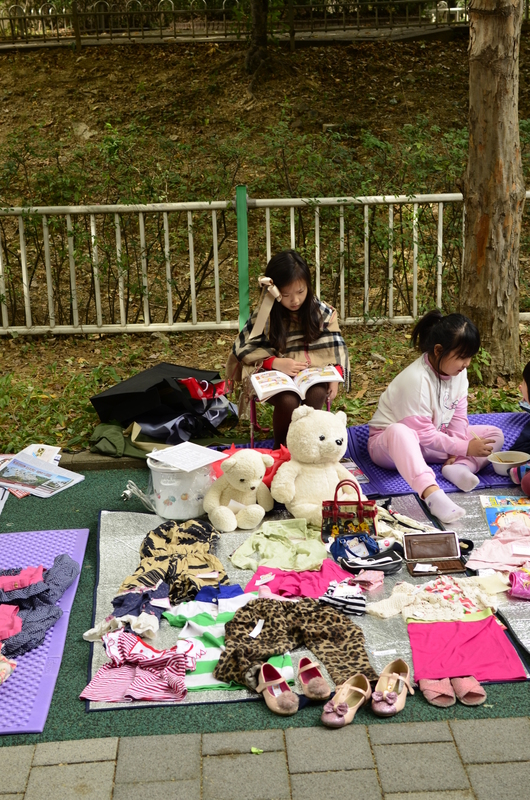 There would be a flea market on a Friday on the roof of the AK Plaza at Suwon was our destination, and the customers were sure to be women, but more importantly young or expectant mothers keen to snap up a few bargains in the hunt for appropriately equipping their little bundles of joy – and by appropriately I mean with as much stuff that the other kids don’t have and at as cheap a price as possible. We set the bar high, asking for high prices on most of what we had. 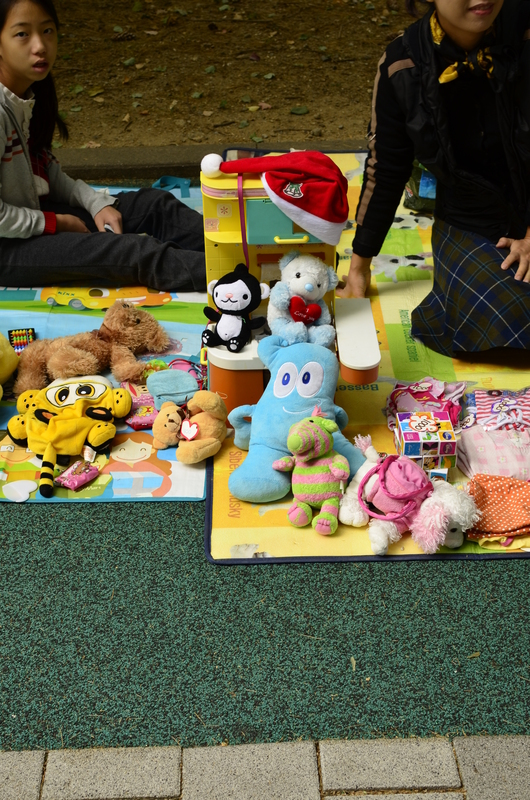 We had done some research and found stuff in no where near as good quality as the baby clothes we were selling on the internet, and it was going for what we thought to be unreasonable prices. Let’s not forget we had some good stuff, especially for a baby about to be born in October or who wasn’t that old. +1 was born in November and we needed as much winter clothes as possible, and now that they were too big we needed to make room for more. There were some other things as well, nice stuff that you couldn’t find in Korea, including some fancy brands and the likes. What I gather now is that people go to these things expect everything to be 1000 won. That’s the only explanation as any time we quoted a price people would turn the nose up, complain it was expensive, and then trail off. The odd time they’d come back, showing interest, ask about the price, expecting us somehow to suddenly go “oh that one, oh, sorry we meant to say it was free, not 10,000 won”. I gather that these things are suppsed to be a good way of getting your hands on some cheap stuff, but clearly the notion that people were also trying to raise a little cash was beyond them. I won’t even start a discussion on value. We persevered and came out relatively well. We didn’t sell half the amount of things we hoped, and we left with a very full and heavy suitcase. Regardless, we made almost 200,000 won. I’m not really sure how much stuff we sold, but if we were to do a comparison, I sold about 15,000 won’s worth of stuff whilst herself, a shark in her previous life, seemed to do better. Despite our attempted tenacity our prices probably quartered from what we had discussed the night before, and to add insult to injury (not that there really was any), herself’s friend who sat next to us sold four things and nearly made as much as us. I suppose in the end it depends on what you’re selling not how much you’re selling it for. Today we were ready to go again with another flea market. This time it was again our local 4 danji neighbourhood annual event. We brought down our wares and set things up. Unfortunately, baby clothes were not considered to be as hot a commodity as we’d hoped. 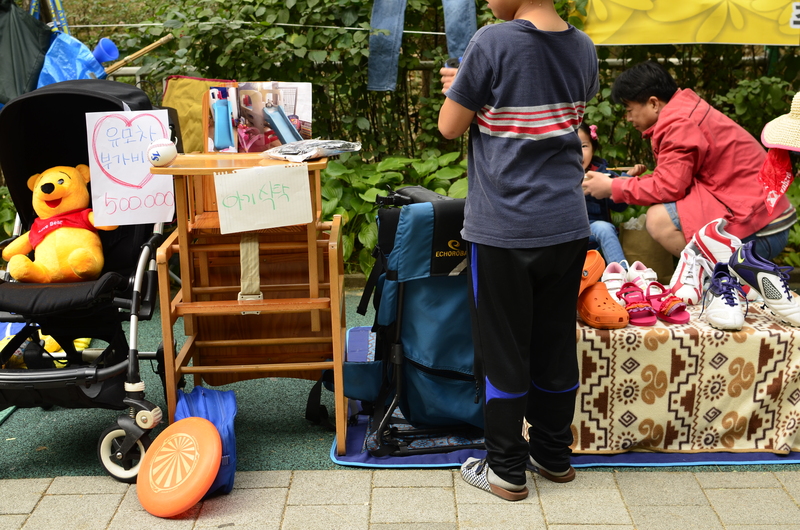 Most of the people there had kids who were actually doing the selling while the mothers and fathers stood around chatting and drinking coffee mix. 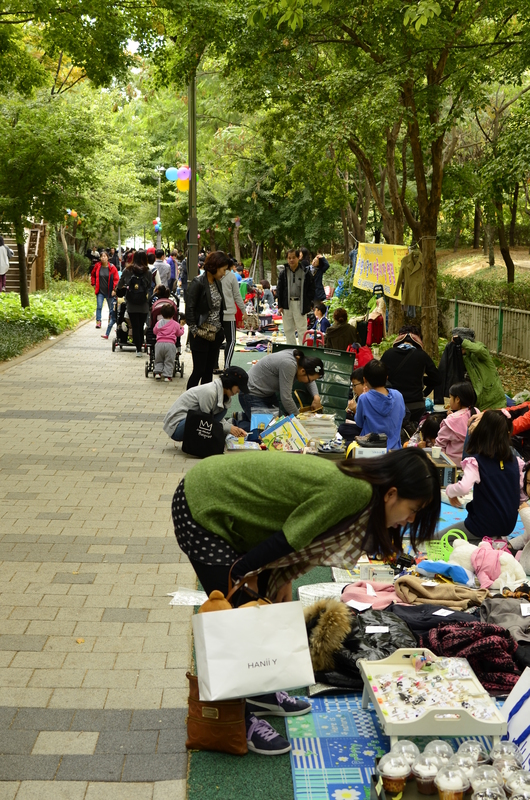 The location for this flea market makes it nicer, as it is covered over by trees, and pretty much everyone has to follow the same route. The people are mostly friendly, inquisitive, but also keen not to spend more than 1,000 won on anything. I don’t think we were much better. As was to be expected we sold a few things, but we didn’t have the diversity of bric-a-brac which are suitcase had last year, and the clothes we were trying to sell just weren’t suited to the customers. As Herself said, we’ll have to go to Hongdae ot sell half of this. But these things aren’t all about selling stuff, because people have to buy things right. 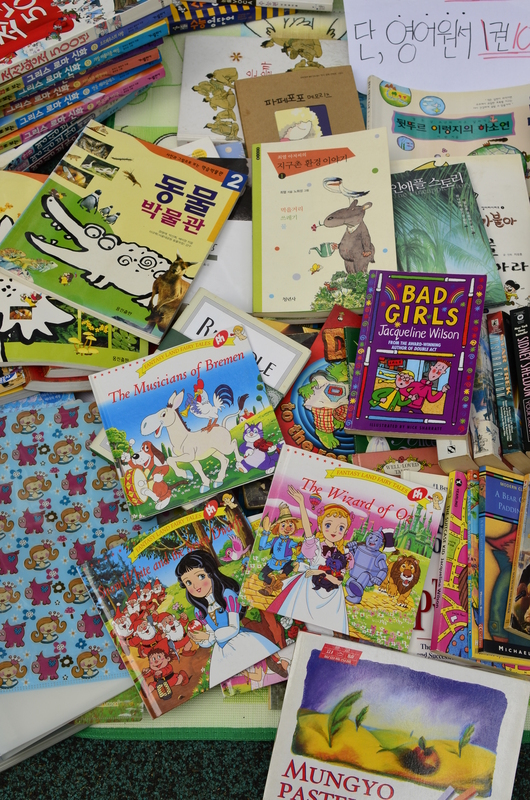 We did a little shopping of our own and came out in good nick with a bread maker which we scooped for 10,000 won, and I picked up a stack of baby story books in English for +1 as they’re pretty hard to find here without forking out top won for them. We had some more nice noodles, chatted, met some people we hadn’t seen for a while, drank coffee, joked with customers, and at the end of the afternoon we trudged back home and the three of us collapsed on the bed for a hour and a half long nap. 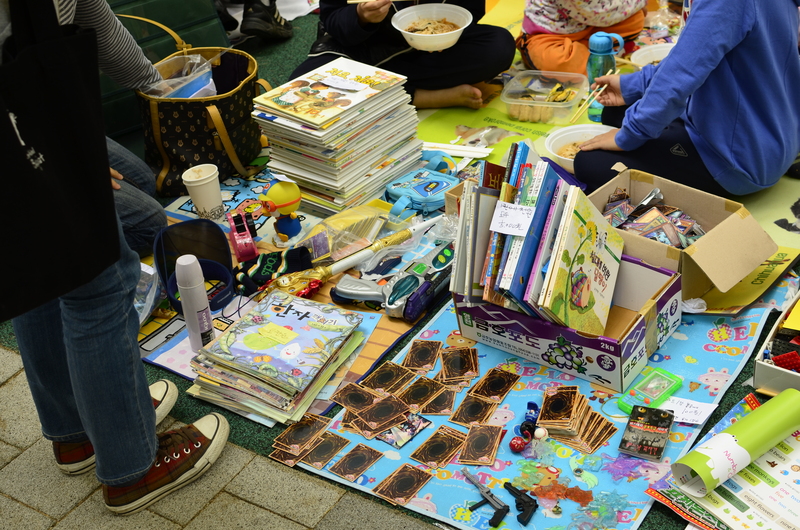 I want to add to this post that perhaps the best flea market you can visit in Seoul has to be the one around Dongmyo Station. It probably sells nothing you will ever want to buy, unless you need half an obsolete mobile phone or a violin with only two and a half strings. This one is purely for those who wish to explore, and it is a mecca for that resource. This entry was tagged 2013, Asia, Blogging, bric a brac, buying, children, clothes, Conor O'Reilly, expat, experience, flea market, for sale, friendly, home, indie, kids, korea, koreans, living, living in korea, Local, market, neighborhood, neighbourhood, october, Photographs, sale of work, selling, shopping, stuff, suwon, today, toys, wares, yeongtong. Bookmark the permalink. Love this. You are my new favorite couple aside from my great-nephew, his wife and their +one. I love flea markets I love shopping, I love selling. I am interested in that children’s book called Bad Girls. I am glad my husband didn’t read a book like that before we met. Lol…if you knew me, you would laugh. That book does look interesting. I wish I could tell you where my nephew lives, I forget the name and all the damm names look so similar I couldn’t find it on the map. No offense….if you like coffee, they have started a little family business…they are micro roasting coffee…. Check out their blog. His wife teaches English, Cameron is going to school. He is wicked smart with the numbers. He did not get hat from my side of the family, I will tell you now. I enjoyed this story and the pictures. You are my only source for real information about SK, that is not related to dramas and or KPOP. Two things you loathe….am I right? I am one of your regular readers. Thank you! I checked out his blog – they’re down in Daejeon which is about an hour and bit away from me. I might see if he’ll send me some coffee! Daejeon….you speak Korean…lol. That would be so cool. Cameron is really my great nephew. His dad and I are about 7 months apart in age. Cameron’s grandmother ( My sister is my oldest sister….hold your hat, she just turned 72.) there is a huge age gap, but honestly a mother shouldn’t be having children when her children are having children…I think it does something to the space time continuum. Anyway…it would be so cool if I actually recommended his coffee to someone who lives in SK. I cannot testify to it’s taste, but, I do know they have consumed lots of coffee and they know there stuff. Another interesting note..his wife Christie is in to archery, she belongs to a club(close to where they live) and in there favor…i cant get them interested on KPOP at all. i still look forward to sharing something on my silly blog in regards to OUR thanksgiving. I promised to make you hungry. hubby and i are very normal as well. we like normal…a lot. Cheers!! !